Late-cyclical drivers such as strong labour markets and rising capital spending suggest continued healthy growth both this year and next. Political events will cause concerns but probably not hamper growth. In our view, the fundamental outlook remains bright. So far during 2018, we have been moderately overweight in risk assets, such as equities and corporate bonds. We stick to this position for the time being. "Given the combination of a global capital spending cycle that is fairly young and a healthy, broad-based growth rate, we believe that both the economic cycle and the earnings cycle will last longer than many observers are expecting. It would thus be too cautious to recommend a clearly defensive portfolio today, but the late-cyclical phase we are in - combined with higher expected volatility - suggest that we will have more varied risk exposure ahead," says Fredrik Öberg, Chief Investment Officer, SEB Private Banking. One way of allocating risks is to find areas with their own structural driving forces that do not follow the global economic cycle. The Indian economy is one such example, since it is undergoing a transformation with its own underlying drivers. India is now the world's fastest-growing economy of significant size. 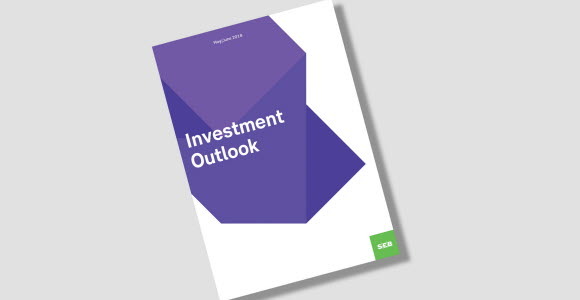 This issue of Investment Outlook includes a theme article in which we present our view of the outlook for India and its capital market, which we believe is bright.